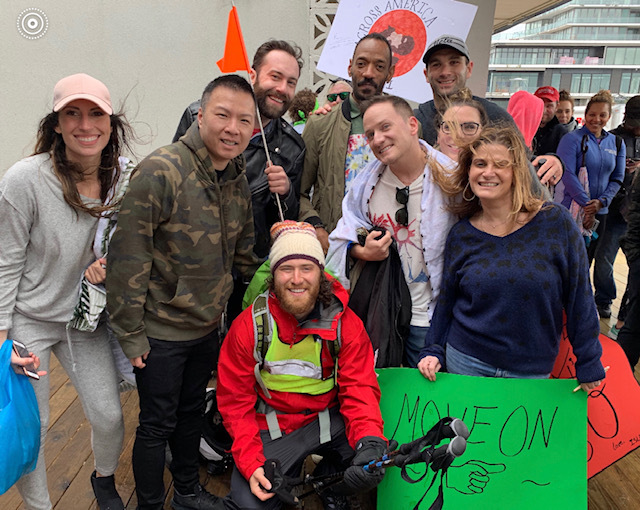 On a rainy day in Asbury Park, NJ, Island artist Mike Posner kicked off his vaunted walk across America, with his label team and manager Ryan Chisholm there to cheer him on. Island boss Darcus Beese said that the joint he'd helpfully furnished would allow Posner to walk between the raindrops. Later, head of promo Ayelet Schiffman requested a stone pony for her birthday. Seen wishing we would just fuhgeddaboudit are (l-r) Island's Erika Clark, COO Eric Wong, Digital exec Andy Beam, Posner, Beese, Marketing player Tony Corey, Chisholm, Island's Erin Dunleavy and Schiffman.